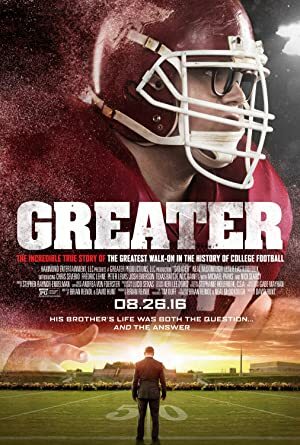 Greater (2016) – What's New on Netflix Canada Today! Brandon Burlsworth is perhaps the greatest walk-on in the history of college football. Brandon had always dreamed of playing for the Arkansas Razorbacks, but was considered too short and too fat to play Division I. Undeterred, Brandon took a big risk and walked on in 1994. Written off by fellow teammates and coaches, Brandon displayed dogged determination in the face of staggering odds. An extremely devoted Christian, Brandon never cursed or drank. He was genuinely humble and low-key. He worked harder than anybody, on and off the field, becoming the first Razorback to earn a Bachelor’s and Master’s degree while still playing. The overly-fat kid who was once an embarrassment to his teammates and an annoyance to his coaches, ended up becoming the most respected player in the history of the program, changing the lives of all he touched. Eleven days after being drafted into the NFL, Brandon was tragically killed in a car accident, crushing all who knew him. Brandon was “too good to be true”. How could something like that happen to this guy? The age-old question slammed down upon all with terrible force: “Why do bad things happen to good people?” Brandon’s story is more than mere football. It is the ultimate expression of the question “Why?” Greater will provide hope and inspiration as it strives to wrestle with this challenge and find reasons to trust. It is “Rudy” meets “It’s a Wonderful Life”.